For me, one of the great joys in traveling is meeting people and sharing experiences with them. During our travels, we have been blessed through the relationships that we have established and continued to nourish. This trip was no different...during our tour of China we had the good fortune to be grouped with people that were extremely compatible and just plain fun to be with. On the Regal Princess our bus, the Y3, bid and purchased a horse for the big race. Jointly the group dressed the horse and cared for the horse (a wooden facsimile to a horse that is) and while sipping champagne in the owner’s box on the big day of the race, we cheered our horse on to victory. The fact that we won almost two thousand dollars didn’t matter at all (right!!! )...it was the camaraderie that really counted. And at dinner we were fortunate to be seated with some of the most pleasant and caring people that only made our journey that much more pleasant. Along the way we also crossed paths with many other individuals that brought good times to our travels. The Regal Princess is not a big ship by today’s standards and old compared to other ships that are cruising the seas today. I thought it was a nice ship, but it seems that Princess and maybe other cruise lines are starting to cut corners and shaving services that were heretofore considered a regular part of the cruising experience. Many of these changes became apparent as soon as our cruise began, but unfortunately they were never discussed with us or explained. In fact, there were many unhappy guests, but in the end the good times come to the forefront and that is what we remember. Another guest, when we were discussing the problems, called it K-Mart cruising. Our cruise visited eight ports over the sixteen days voyage and while the ports selected were excellent, the time in port was often much shorter than we would have like or expected. Again, this may well have been a cost factor, whereby the ship reduces its exposure to the port facilities thereby keeping its costs down. I am not sure that I would ever book a cruise on the Regal Princess again and I would be ever more careful in getting details about shipboard facilities and port visits before I pay for a cruise in the future. In any event, the staff on board the ship was just outstanding and that made the trip a success. All through the trip, whether we were on land tour or making port visits from the ship, many of the people were extremely concerned with shopping. Sometimes, I thought that it was not the temples, Buddha's, museums, food and getting up early that interested everybody...it was the shopping. And everywhere we went, shopping was in the forefront of everyone’s mind. Certainly, it was on the minds of the 400,000 vendors that stood before us with outstretched hands no matter where we were. In this part of the world, shopping (and selling) is a significant part of the culture and it is very easy to get caught up in the excitement of the moment and the conquest of the negotiation. Tours in each of the ports were available via the Regal Princess which we originally selected but then decided we would rather check out the places of interest on our own. Often it was more efficient touring on our own as we would not have to wait for the return of all tour members, since some people were caught up in the shopping process. Also, there was a sense of adventure being out alone in a foreign city and learning the culture directly from the people. Pusan is located at the southern tip of the Korean peninsular and is our first port stop. It is a major city, with a population of four million people and a large ship building industry. It is also engaged in other industries that are associated with automobiles and semi-conductors. A significant factor in Pusan’s cultural development is the fact that it has a Starbuck’s coffee shop...the second such great find on this trip. We visited the Pomosa Temple built in 678AD and destroyed in 1592 during a Japanese invasion. This was one of many Japanese invasions and occupations of southern Korea (forty years of Japanese occupation in the 20th Century alone ended in 1945) and as such, there is no love lost by the Koreans with regard to the Japanese. Korea has been a central place to which early civilizations migrated and it has remained a meeting ground for influences from other cultures in the region. During the Silla Dynasty, known as Korea’s Golden Age, Koreans began a wholesale adoption of Chinese political, religious and cultural institutions. Later, we visited the Cha-Gal-Chi Fish Market located down by the fishing docks. Established by women fish peddlers, it is a market that comes to life early morning as fresh fish and other delicacies of the sea are haggled over by fisherman and wholesalers. 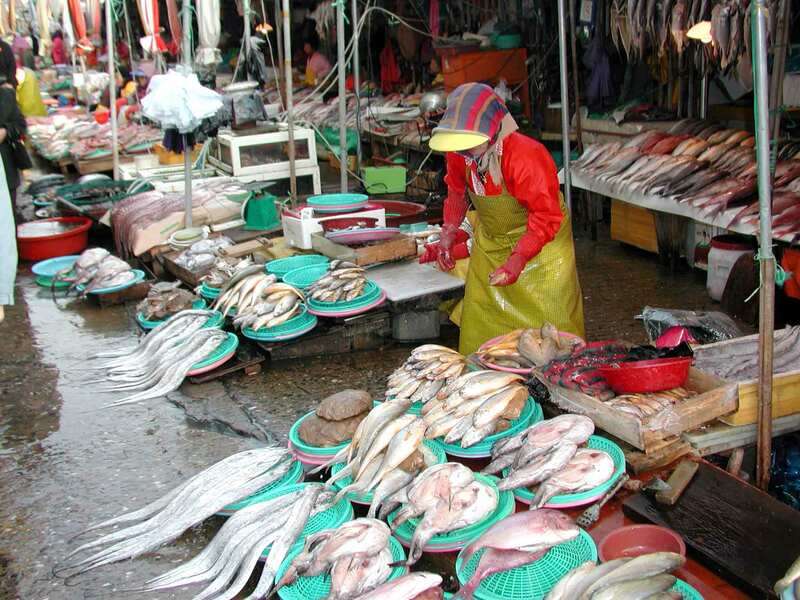 It is not a formal market, fish and other items are placed in buckets, pans and boxes on the floor or on low tables, but it is most colorful and an interesting place to visit. On our own, from the dock, we had a short walk into the city area, where we picked up a tram to the Peace Memorial Park. There is a large fountain at the park and also a bronze peace statue built in 1955 that reflects on both the threat of nuclear war and on tranquility and world peace. 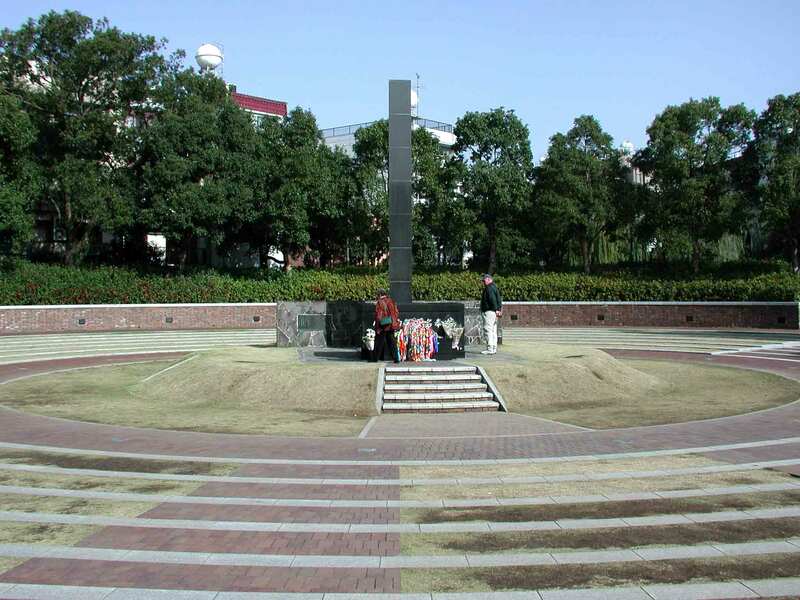 The park memorializes the dropping of the Atomic Bomb on Nagasaki in August 9, 1945 where almost 74,000 people died and 75,000 people were wounded in the blast. We then walked to the park that marks the epicenter of the bomb blast with a stone monolith. We then visited the Samo Shinto Shrine, a one-legged Tori gate that partially survived the blast. A short walk took us to the International Cemetery that contains a “Hebrew” section which was established in 1892. The Scottish born merchant, Thomas B. Glover is buried there, but his home and gardens still stand on a hill well above the port area. The Glover House, which we toured, was built in 1863 and is one of the oldest examples of western architecture in Japan. In the garden is a statue of Puccini with a butterfly on his shoulder, which commemorates the opera “Madam Butterfly”, which takes place in Nagasaki. Of all the cities that we visited, I enjoyed Shanghai the most...possibly because it had such mix of old and new as well as a history and a future that we could see and feel. It had a sense of excitement about it, where the people that we interacted with seemed involved with the changes being realized in China today. The harbor is what Shanghai is all about...the old section of the harbor, the Bund, is an elegant picture of Shanghai from times past...with beautiful buildings that are lit at night and contrast with all the new and modern skyscrapers in the Pudong section of the city across the harbor. The old is represented not only by the Bund, but by the Old Town, with its stores, restaurants, a Starbucks Coffee Shop (Who would have expected anything less?) and the Yu Gardens. Yu Gardens is a five acre site in the middle of Old Town, with rocks, a pond, plants, houses, gardens, dragon walls....and it steeps with character. 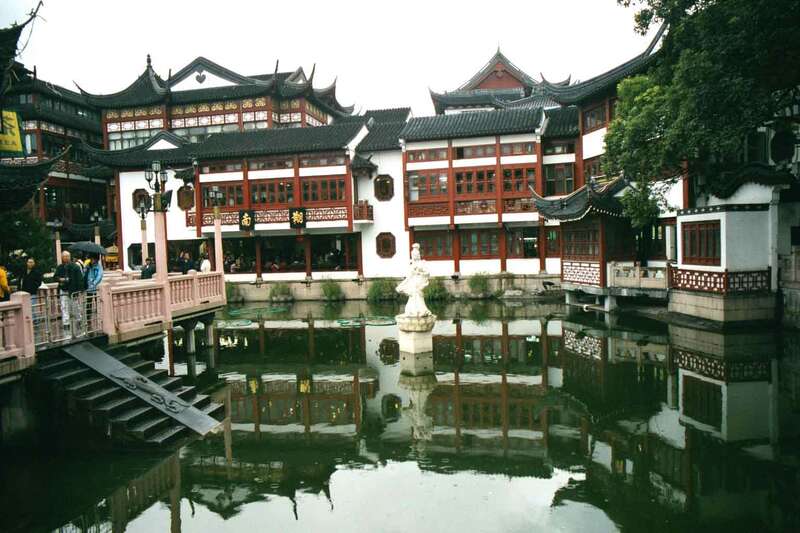 There are many museums that tell of Shanghai’s past and its transition to a modern city. 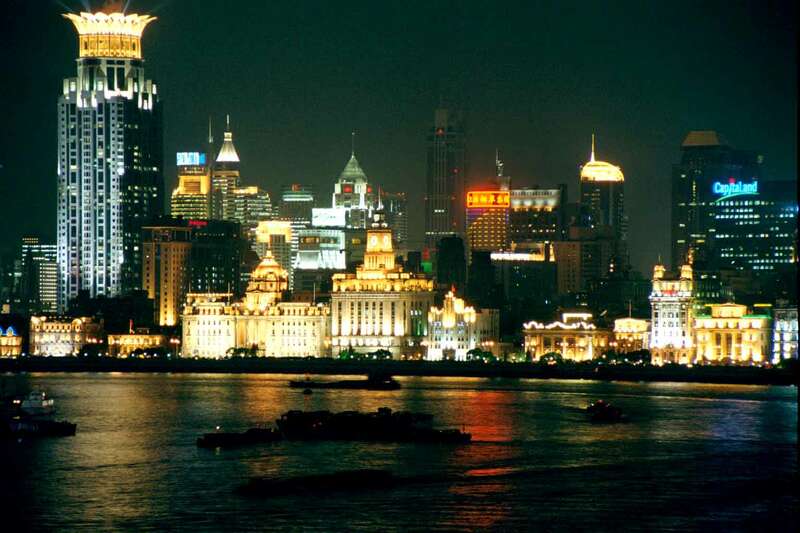 Shanghai’s port is on the Huangpu River, which is at the mouth of the Yangtze which feeds into the South China Sea. 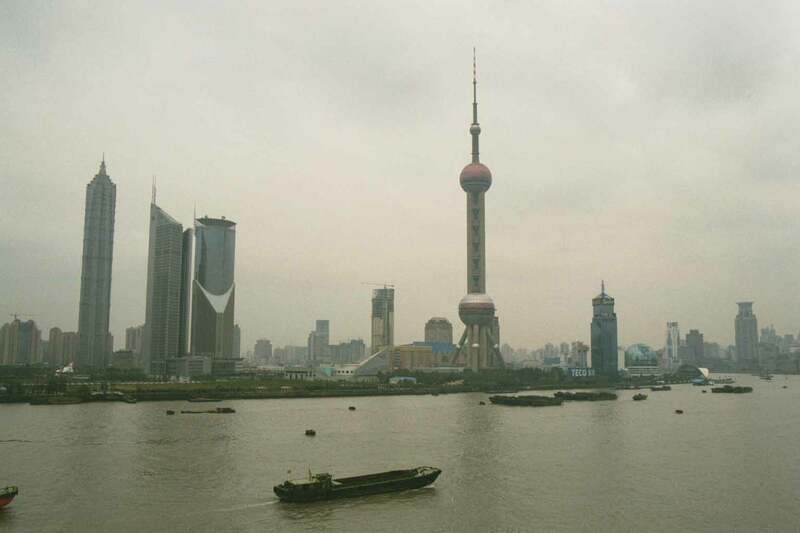 Shanghai is China’s door to the world of commerce. The newest part of Shanghai is the Pudong section across the harbor from Old Town and is connected to the older sections of the city by a tunnel. The Pudong section sports a brand new eighty-eight floor Hyatt hotel, the 468 meter Pearl TV Tower and a host of other modern skyscrapers. This area is exceedingly populated with huge buildings none of which even existed just a short ten years ago. 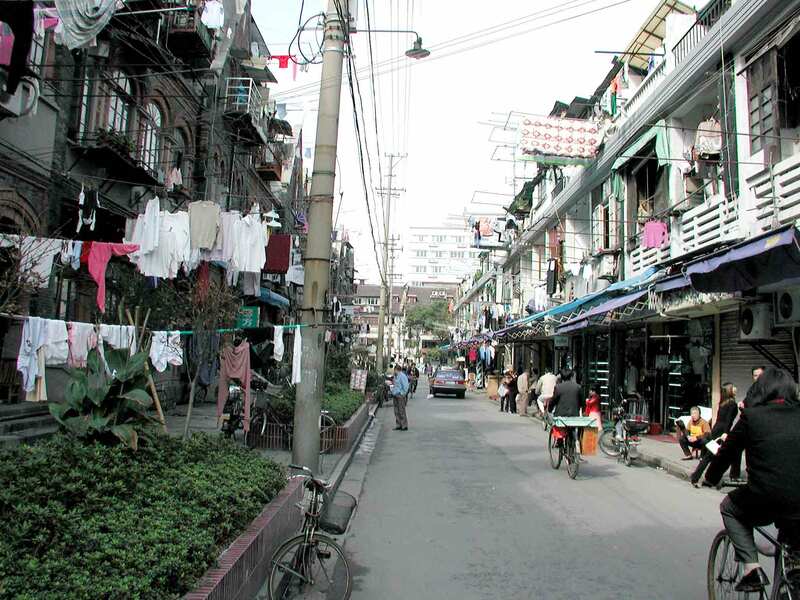 Shanghai was occupied by the Japanese during WWII, at which time there was a Jewish ghetto comprised of 27,000 Jews that were fleeing the Nazis. The Germans had requested that the Japanese exterminate the Jews in Shanghai, but the Japanese refused and under the Fugu Plan in 1939, the Japanese built a wall around the ghetto and limited the movement of the Jews. We visited the Ohel Moshe Synagogue museum, which was a Russian Ashkenazi synagogue in 1927. A caretaker provided a detailed history of the synagogue and of the Jewish life in the city. We also visited a park where the Beth Aharon Sephardic Synagogue once stood. Today, there are sixteen million people living in Shanghai some in modern housing developments and many nearer the inner city in very old homes, most without any running water or inside bathroom facilities. These structures are slowly being demolished and are being replaced with new, modern high rise buildings. Our ship was in port for two days so we had the opportunity to visit the Pearl TV Tower for a view of the city from the observation deck and the Shanghai Historical Museum, had lunch and shopped (what else) in Old Town, toured the Yu Gardens, and walked the Bund area at the waterfront. We needed yet more time, but with such a big city....there will never be enough time to fully learn and appreciate Shanghai. Now that Britain’s ninety-nine year lease of Hong Kong has expired and Hong Kong is a part of China, it continues to maintain its own and distinct identity. It even maintains its own currency, the Hong Kong dollar, and they reluctantly accept the Chinese Yuan. It seems that if China is the factory, then Hong Kong is the showroom. Complete with large, modern skyscrapers that house financial firms, insurance companies, shipping companies and more ...it has a pulse that appears to be primarily Western in most respects. Upon arrival in Hong Kong, Lila took I took a ferry from Kowloon across the harbor and walked to the Peak Tram for a sensational ride up to Victoria Peak, at 1800 foot the highest point in Hong Kong. The view was magnificent ....no it wasn’t, because of the overcast sky I think we could see one hundred feet. But, if the weather was clear, I am sure it would have been an exceptional view. Back down the tram, we caught a bus ...a double decker bus to Repulse Bay, the Aberdeen Fishing Village and of course, Stanley Market. Stanley Market tries to be like the markets we had visited in other parts of China, but it doesn’t make it....it did not even come close, so we beat a hasty retreat. Back across the harbor to the Kowloon Section of Hong Kong, I made this amazing discovery....another Starbucks coffee shop. This trip is really beginning to shape up...imagine four Starbucks coffee shops in Southeast Asia ...it doesn’t get any better than this. After a splendid cup of coffee, we head on over to Nathan Road...a very upscale shopping area for the tourists...well, at least they thought so. The difference here is that they sell the real stuff at real stuff prices ...but is it real stuff or is it knock off products that are sold as the real thing. They provide genuine U.S. warranties for the products ...get real. They even have four “authorized” Rolex watch stores on one block ....sure they are! 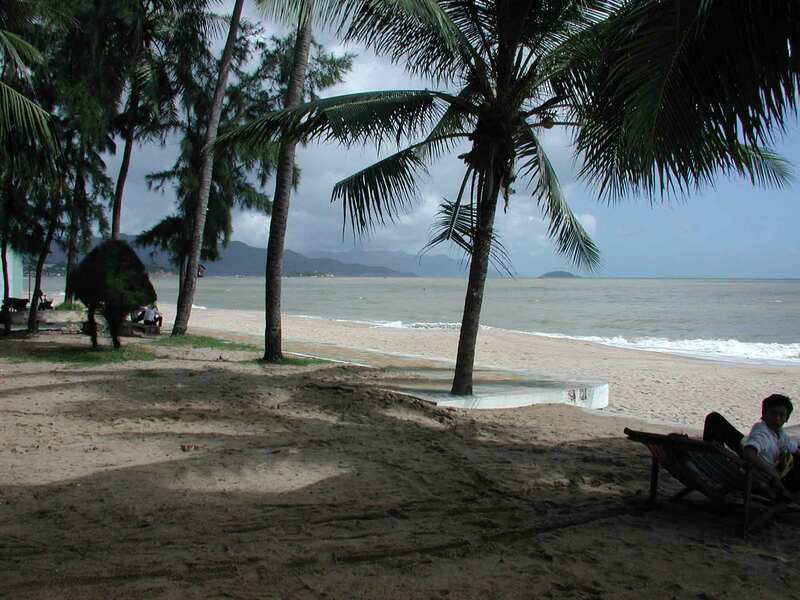 Nha Trang is a sea side resort that was popular for R&R with the American forces when they were fighting in Vietnam. Today, it has lost its luster and while the beach area is nice, all the streets in and around the beach area are quite seedy. There were a few small hotels along the main road possibly supporting some Asian tourist business. We tendered in from the ship and were greeted by hordes of vendors and rickshaw bicycles all wanting “one dollar” for their wares or services. I made the mistake of acknowledging one of the rickshaw drivers and he followed us over one mile, while we walked along the beach, hoping that we would get into his “vehicle”. To get him to stop following us, I finally gave him a dollar asked him to leave. He gladly did so with a smile and a wave. The weather was extremely hot and muggy in Nha Trang ...the first time we had encountered such uncomfortable conditions, but then we were heading south, and getting ever closer to the Equator. Not too much to do or to see, so we headed back to the tender dock and to the ship ....and air conditioning. Saigon, or Ho Chi Min City, is an extremely interesting city for me because of its history to the long Vietnam War. The ship docked in Phu My, which was about a two hour ride from Saigon and the drive into Saigon gave us a picture of life today in this country. An exceptionally poor country ...the Vietnam villages along the road were filled with little shops in a grimy, filthy air polluted milieu. The traffic was intense as bicycles, motorbikes went every which way on the roads and competed for position with the cars, buses and trucks ...sometimes they lost the fight, but most of time it was a draw. Arriving in downtown Saigon, the air was close and the weather was hot and muggy. The streets were teeming with traffic that does not stop...it just maneuvers around you, if you have the pluck to just walk straight ahead in the face of this oncoming attack. Many of the buildings dated back to an earlier era ... architecturally they were exceptional designs and some are still maintained quite well. There were gardens in the streets and a very bustling business community with many people on the street selling to the tourists and little Mom and Pop type shops selling tourist products as well as local household items. 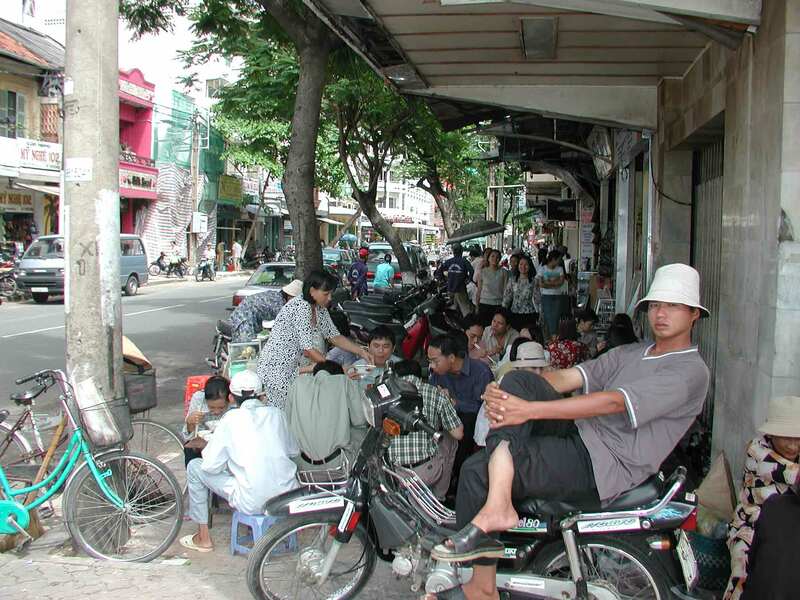 I was told that Saigon, which it is still called that by the locals, is a better place to live than Hanoi as it has a larger business community and hence more jobs, as well as more universities and colleges. Some of the stores were quite upscale ...we visited some just to get out of the heat for a few moments. After walking around the downtown area for hours and visiting some of the local markets to shop, we went to the Rex Hotel for lunch. The Rex Hotel is infamous for the weekly press briefings by the U.S. Army during the Vietnam War. It is an old line and very beautiful hotel that has retained much of the character of an earlier time. We had lunch on the rooftop restaurant in a very opulent and luxurious dining room. Then a long ride back to Phu My to get back to the ship. We did not have much time to tour Singapore as is the case with cruise ships, so my exposure to life there is limited. There is a gondola or cable car adjacent to the cruise ship terminal that goes both to Mt Taber and to Sintosa Park. Getting off the ship...we headed first to Mt Taber, where we walked around the overlook for a view of both the city and the harbor... After Mt Taber, we then headed to Sintosa Park (a Disney like amusement area in a large park setting) where we completed a one mile nature walk. From the Sintosa Park, we went back to the ship terminal via the gondola and then an elevator down to ground level, where we caught a bus into town. The ship terminal is also of interest as it is the center where a conference center is being built and the terminal building also houses three levels of stores and restaurants...a mall, a large mall by any proportion. And we had to walk through the mall to get from the ship to the outside world and then back again. The same technique used in most airports, it is an easy way to spend local money and to shop for tourists and visiting dignitaries like us. It seems that every country has learned how to uniquely separate one's money from one’s wallet and Singapore has chosen a very sophisticated approach. Bargaining or negotiating about price is limited in Singapore. Exiting the terminal complex, our bus proceeded to Chinatown and we walked around the narrow streets for a couple of hours watching the vendors selling their wares and the people eating in the outdoor cafes ...fascinating. Again it was quite warm and very muggy...we were now within one degree of the Equator. We then grabbed a cab to little India...walked around and were able to enjoy the ever present fragrance of curry and of various perfumes..... marvelous. We were able to find an internet shop...had some old computers with real small screens. Then we hailed another taxi to the Raffles Hotel, the very posh and renowned hotel ...unfortunately, they would not let me into the lobby because I was wearing shorts ...the nerve of them, so we went around the side to the Long Bar for a world famous Singapore Sling. I really expected Humphrey Bogart and Lauren Bacall to get up from one of the tables at any moment. The room was filled with atmosphere and we happily paid $10.00 for each Sling ....a great buy as we were hungry and thirsty from the long day and the heat and humidity. As I had mentioned earlier, the weather in Singapore was extremely close. We then walked down to Orchid Street, the center of Singapore’s shopping and hotel district...it was Sunday and the stores were mostly closed, but the streets were packed with vehicles and people...and we had a hard time getting a taxi...had to get back to the ship....two people missed the ship, one came out on a pilot boat and the ship had to move back to the dock as it was leaving to retrieve one late arrival. We did talk with some locals...we were told that Singapore is a fine city...you get fined for chewing gum, fined for crossing the street against the light, fined for dropping trash on the ground, etc. It is a highly taxed state and the locals seem to be very unappreciative of the government's strict and tight control on their lives. To buy a car you must bid on a permit to buy, if approved you pay almost twice the cost of a car in taxes and after ten years the car must be discarded and the procedure repeated. Evidently it is very costly to live in Singapore and government controls make life difficult for those who do not make big money. A cab driver told me he must pay $6,000 Singapore dollars a year to the government just to work his taxi besides having to pay a nice sum for the license. I thoroughly enjoyed Singapore ...it is a picturesque city with quaint neighborhoods and massive high rise buildings. Unfortunately, I did not have enough time to truly discover the city and enjoy its culture. No question that if I had more time I would have had another Singapore Sling. Getting off the ship was easy ...it was the packing that was difficult. We had so many clothes from our land and sea segments and getting everything back into the suitcases was a real chore. But, it was time to head home...we were ready or at least I was ready...steady emails from the grandchildren telling me that they miss me and want me home only strengthened my need and desire to see and be with them. It seems that the cities that we visited are never where the ship docks and Bangkok was no different. Arriving at Laem Chabang, we were bused initially to Nong Nooch Cutural Village and Nature Park. We watched a folklore show with drummers, dancers, a kick boxing demonstration, pole dancing and sword battle. They also had a superb elephant show, where the elephants are trained to play ball, paint pictures, etc. Lila and I also had the opportunity to take an elephant ride ...something different and fun. We then walked through their orchid and sculpture tree garden. After lunch we drove to Bangkok and again I was astounded at the traffic and the crowds. For the first time we saw little motorized golf cart like bikes with a double or triple seat in the back for passengers ...called tuk tuks. They zip in and around the traffic and seem dangerous, but are fun if you could stand the exhaust in the already polluted air. I very much enjoyed Bangkok ...the people are very warm and friendly, the Thai food is excellent and the shopping is outstanding. Bangkok is a shopping mecca, because of the knock off products for sale, the clothing (suits made to order in less than twelve hours are delivered by a tailor arriving on a motorcycle) and the orchids. 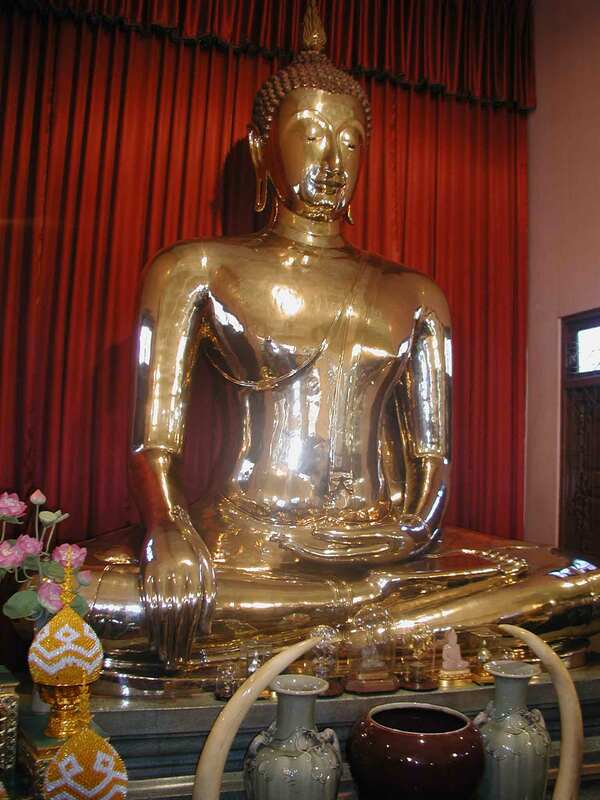 Thailand is a Buddhist country and so we paid our respects at the Golden Buddha, five and ½ tons of gold with eyes made from mother of pearl and black sapphires; the Emerald Buddha, carved from blocks of green jade; we also toured the Grand Palace complex, a one square mile site encompassing the King’s palace and a collection of official and ceremonial buildings all topped by glittering spires and soaring finials decorated with gilt and mother of pearl. 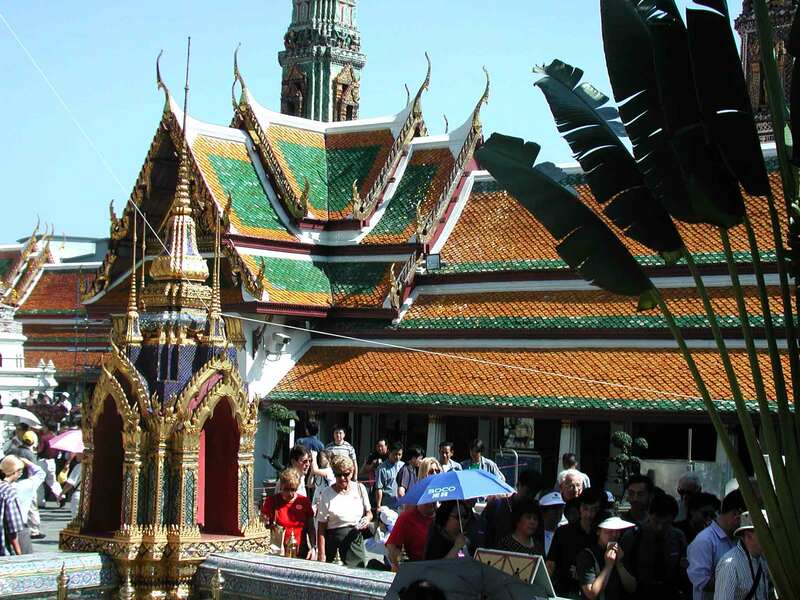 The temples and official buildings are among the most ornate and stunning structures in all of Southeast Asia. We took a boat ride on the Chao Phraya River, that was adjacent to our hotel and had an opportunity to see the real Bangkok, houses built right on the edge of the water. Bangkok has been called the Venice of the east because of the many canals and rivers which can readily flood into houses bordering on their banks. We visited the house of John Thompson, who came to live in Bangkok during WWII and fell in love with the city and the country. He became a distributor of hand painted silk fabric for which Thailand is noted and built a house with exquisite artifacts and antiques. His house is adjacent to a canal and is built on stilts to keep out the rising flood waters. We were in the Shangri La Hotel; an excellent choice for it had a great location, beautiful grounds and award winning restaurants. We ate in the Thai restaurant and were fortunate to have the best meal of the trip and the opportunity to watch classical Thai dancing. Well, the moment of truth came...the trip home, as I indicated earlier up at 3:00am (that is just inhuman) for our 4:00am departure to the airport and our thirty hour trip home. Arriving at 9:00pm, we were home only thirty minutes when our grandsons arrived to greet us...a very warm welcome ...they stayed the night and the next day as well. It took a little while to recuperate from the trip, but we are happy to have had the glorious experience of Southeast Asia.